Review Based on iPad version. When you think about the 80s you might recall certain things like Aqua Net, Acid Washed Jeans, Glam Rock, Big Hair, Miami Vice, Leg Warmers, and the iconic Roland TR-808 Drum Machine! Marvin Gaye arguably was one of the first to really popularize the 808 in 1982, and after later being discontinued found new life and fame thanks to the mid 80s Beastie Boys’ Licensed To Ill. It has been used for decades now by many famous artists, in some classic music spanning many genres. 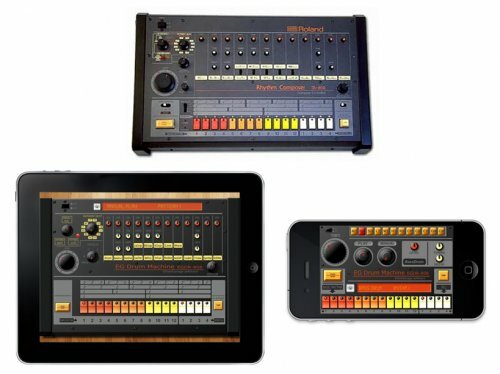 Today owners of the iPod Touch, iPhone, and iPad can relive the classic sounds of the great 808, thanks to iOS app developers like Elliott Garage. Now anyone can have a virtual copy on their iOS devices. You can see from the photo above that attention to detail in recreating the vintage look is uncanny, and faithfully emulated. More importantly the sound is spot on. Elliott Garage really put some love into this going for the same functionalities and feel of the old machine. It’s love you can hear, and music lovers as well as vintage enthusiasts should agree this is one of the best 808s on iOS. At the moment there is no iTunes File Share or Audio Copy Paste. Don’t despair 808 fans, Andrea of Elliott Garage Software Team assured me that iTunes File Share to export patterns will be included in the next update. Being the pushy app lover that I am and stubborn supporter of Audio Copy Paste, I didn’t relent without confirming that they do want to implement Audio Copy, but it will take a little more time. Considering the quality of this app, I think we can be patient for ACP so long as iTunes File Share doesn’t take too long to be added. For $1.99 this is hard not to recommend even if we must wait a little for sharing capabilities to be included. ← Almost ready to release my 1st CD made exclusively on iOS! Well, in my opinion after having tried both on my best monitors with sub woofer that EG DR808 has better bass response than Rhythym Studios does at higher volumes.RS has a nice 808, but can become muddy at the same audio levels I tested.